I have been on a romance movie kick since the summer, and these were the two movies that started it all. 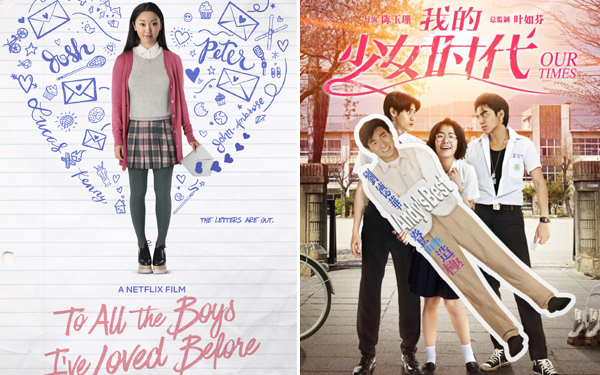 Both movies have a similar vibe: cute teen romance and chemistry between the two leads that lead to their rise in stardom. Both movies also became popular in their respective countries, and as a plus, were written and directed by women. To All the Boys I've Loved Before narrates the navigation of Lara Jean to the world of crushes and romance. For most of her life she has had a crush on Josh Sanderson, her next door neighbor - who also ends up being her sister's boyfriend. As a way of moving on from her crush, she writes a letter that encompasses her feelings towards him and is revealed that she had written four other letters in the duration of her life. Her story begins when her letters were sent out and her crushes start to confront her, including Peter Kavinsky, the boyfriend of her ex-best friend Gen. To make Gen jealous and to make Josh believe that Lara Jean has no residual feelings for him, Peter and Lara Jean begin a fake relationship. Despite the overwhelming positive response, this has mixed reviews from people who have read the Jenny Han trilogy. It could have been better, but this was a great adaptation. One of my main problems with the book is that Lara Jean does not sound like a teenager; she sounds like a pre-teen for most of the books. Her speech and general mannerism were better in the movie due to the portrayal of Lana Condor and how Sofia Alvarez (screenwriter) had improved on the character. It also helps that Condor has a fantastic co-star in Noah Centineo. The actors bounced off each other in an organic way that they sold their characters. While I truly adored this movie, I did have an issue with it. While the narrative is about Lara Jean and Peter, the circumstances of the relationship were leaning towards Peter's issues rather than Lara Jean's. While the fake couple got their point across in terms of dealing with Gen, there weren't many scenes to highlight Lara Jean and Josh's dilemma that would warrant Peter's jealousy. Whenever he would spot Lara Jean talking to Josh, he would have some kind of fit, but if it was the other way around, he would play the 'history' card, something Lara Jean also has with Josh. If the narrative between Lara Jean, Josh, and Peter were improved, it really could have better. Still, this was an adorable, cute movie. Our Times runs as a flashback to Truly Lin's high school days, as the adult version of her reminisce about that time in her life. Young Truly Lin is a bit of an outcast. She's not smart nor well-liked, but keeps a positive attitude on things. She's the biggest fan of Andy Lau, and also has a crush on Ouyang, the most popular boy in school. In a situation involving chain mail, she gets thrown into the path of TaiYu, the school's resident gang leader. She finds out that TaiYu has a crush on Min-min (Ouyang's counterpart), and they team up to break the two up. As the movie goes on, the friendship between the two flourish, and the changes that happen to them act as catalysts to the narrative. What cinched the movie was the performance of Vivian Sung and Talu Wang, and the chemistry between the two characters as well as the story itself. It doesn't shy away from the melodrama that's usually present, but the confession behind it was heartbreaking that I'm giving it a pass. The writing foreshadows the dramatic aspect the characters face, but is weaved seamlessly through the narrative. I could do without the movie as a reminiscing point for the adult characters, but even the reasoning for starting the movie for what it was makes sense, all thanks to the writing. Sabrina Tseng wrote the script well and gave attention to so much detail that made the film work. Girl Week is hosted by Dell on Movies and is running from November 19 - 25. Click the banner for the announcement post! Thanks a bunch for joining in! I watched To All the Boys with my daughter. She loved it. I liked it well enough because, if nothing else, it's insanely cute. Haven't heard of the other movie, but it sounds very similar. If that's on Netflix, I might show my daughter that one. Thanks for hosting! To All the Boys was very cute, it has made my go-to movies list if I need something to cheer me up. I haven't seen either of these, I almost started TATBILB the other day on Netflix but I ended up on something else. I've never heard of Our Times until now. I'll have to see if I can find it. Both of these are new to me but they both sound worth catching. I like a good romantic comedy as much as the next guy. Enjoyed reading the reviews.